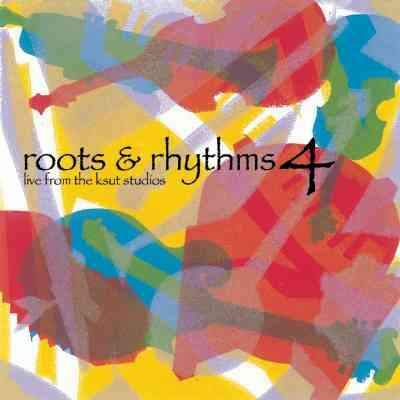 The artwork for the cover of Roots & Rhythms Vol. 4, a sampler CD of various artists who performed in the KSUT Public Radio station’s studios, was done by Durango artist Maureen May. To put a twist on a worn-out adage, the fourth time's the charm.The latest Roots & Rhythms CD - volume 4 - just came out in time for KSUT Public Radio's annual Winter Fund Drive. And coming on the heels of three previous CDs, this fourth proves the quality of the artists the public radio station works to bring to perform in Durango. That's not to say the first three volumes aren't stellar. But this CD sampler shows how the station has honed its skill at picking the best performances Durango audiences took in during the last couple of years. Roots & Rhythms Vol. 4 includes 19 tracks from artists who have performed live in KSUT's Ignacio studio. Each artist dropped in to the station for preperformance interviews and to play a few songs for listeners. From those various visits, KSUT's station manager Stasia Lanier culled the best of songs that end up representing the acoustic talents of singers. Among the favorites is Steve Earle's "City of Immigrants." His political song is catchy, boosted by his wife, Allison Moorer's vocals, and is stripped down and bare. I'm sure KSUT's listeners will appreciate Earle's now-famous song that pays homage to the diversity of the Big Apple. (A side note: Earle's is the only song on the CD that wasn't recorded in the radio station's studio; it is recorded live during his performance at the Community Concert Hall at Fort Lewis College on July 9, 2008. )The joyful lyrics and distinctly flexible voice of Martin Sexton comes through on "Happy." Sexton's voice carries clearly throughout the track of him singing about domestic bliss on the "first day of summer vacation." Sexton sets the tone for the next track, "No More to Leave You Behind," by Infamous Stringdusters. These six Nash-ville-rooted bluegrass players pick and pluck clean lines while Andy Hall provides steadily sweet singing true to the band's tradition. Hot Club of Cowtown pulls out all stops on the tempo of "I Can't Go on This Way." This track is categorically Western swing. Newcomer to a KSUT sampler is Alejandro Escovedo, whose "Evita's Lullabye" is an inspiring, beautiful ballad about his mother's love for his deceased father. The purely instrumental "Wild Horse Stomp" by The Blue Stone Project is the only nonvocal track on the CD sampler. It's a good way to wrap up the compilation after listening to some stellar performances by some new voices and some favorite familiars. It's noteworthy that volume 4 has returning artists: Dave Alvin, Sexton and Tim O'Brien & Cornbread Nation. These guys have played on previous volumes, all three of which are now out of print. So you know that the remaining new 16 artists on this volume are a welcome addition to KSUT's niche samplers. Another familiarity on this CD is the cover artwork by Durango artist Maureen May. May has done the art for all volumes. With this one, she created a brilliantly colored collage of musical instruments. This cover shows May's range of talent and artistry. Most known for her steady-handed cut images, she enhances this sampler volume by matching the expressiveness of the musicians with her striking art. Lanier has done another fine job of making sure the quality of the recordings on this CD is top-notch. The sound is nearly flawless and shows just how careful KSUT is to preserving the musicians' sound during in-studio performances. T-shirt with Maureen May’s artwork is available for a $10-per-month pledge. To pledge during the fund drive, call 563-0255 or visit ksut.org. Shemekia Copeland, "Beat Up Guitar"
Steve Earle, "City of Immigrants"
John Cowan Band, "Tuesday Afternoon"
Infamous Stringdusters, "No More to Leave You Behind"
Marty Stuart & The Superlatives, "Bluegrass Breakdown"
Hot Club of Cowtown, "I Can’t Go On This Way"
David Bromberg, "I Like to Sleep Late in the Morning"
Sonya Kitchell, "No Matter What"
Jim Lauderdale, "I Met Jesus in a Bar"
Tim O’Brien & Cornbread Nation, "Family History"
The Belleville Outfit, "Sunday Morning"
The Blue Stone Project, "Wild Horse Stomp"